An Accidental Stalking - Really, What Were We Thinking? 1.) The Police said it best when they said, “Every breath you take/And every move you make/Every bond you break, every step you take/I’ll be watching you”. Write about a time you believed someone was watching you. I don't tell this story often, but I once had a stalker. 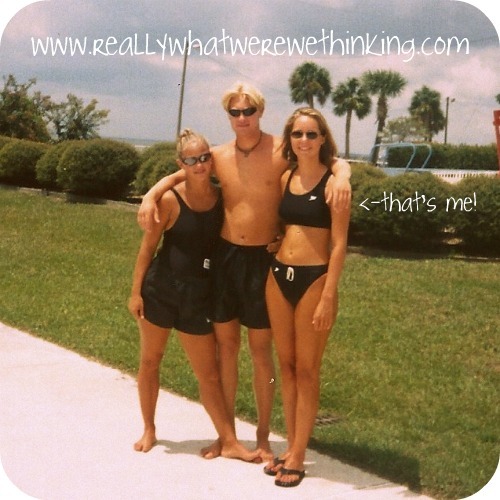 I was a lifeguard in my early twenties and in easily the best shape of my life. I worked outdoors in a swimsuit and swam at least half a mile every day. One day, I was leaving work & headed out to my car when I noticed a note on my windshield. The message was fairly vague, just letting me know that someone was watching me & that they'd like to get together soon. My friends & I have unusual senses of humor, so I assumed it was a friend pulling a prank. Everybody knew where I worked & I'd often have people come by & visit during the day. I put the note in my glove box & called it a day. A day or two later, I got a phone call from one of my friends. She wanted to let me know that a guy who had once stalked her was out of JAIL and trying to contact her again. He mentioned that he saw her working WHERE I WORKED and she wanted to let me know (I was the only female that even remotely looked similar to her). She had already contacted the police and I told her about the note. So, my one & only stalker wasn't even stalking me. I never got another note on windshield.